Real-life assessment on key markets with actionable Singapore stock picks by Singapore’s Top Tier Remisier and Trader. Are you looking for a head start every single month in the stock market? Want to know if the bullishness or bearishness can continue or maybe even a reversal? What about the key technical levels or economic factors to watch out for not only in Singapore but also the rest of the world? Join me as I will share with you my take on key global markets every month, with key focus on the STI. I will also let you know exactly the sectors that I will be focusing on and perhaps you should too. More importantly, I will provide you with Real Life ACTIONABLE trading ideas. Specifically, what stock to buy and sell or which to avoid like the plague. I will reveal my very own Top 5 stock picks every month for more potential upside (long) or downside (short) which you can put in your watch list too. ✔ Analysis of key markets like US, Hong Kong, China and of course Singapore. ✔ Key Factors to watch for the entire market. ✔ Sectors to avoid and potential sectors for more upside. ✔ Live chart analysis with simple entry and exit levels. ✔ Specific stock picks to keep in your watch list for more upside or downside potential. In additional to the Monthly Video, Exclusive BONUS: Long and short counters that Joey has in his watch list. (1 - 2 counters per week) on an ad hoc basis. This will be issued in an exclusive, private discussion group, with charts and a quick analysis which you can possibly put in your watch list as well. 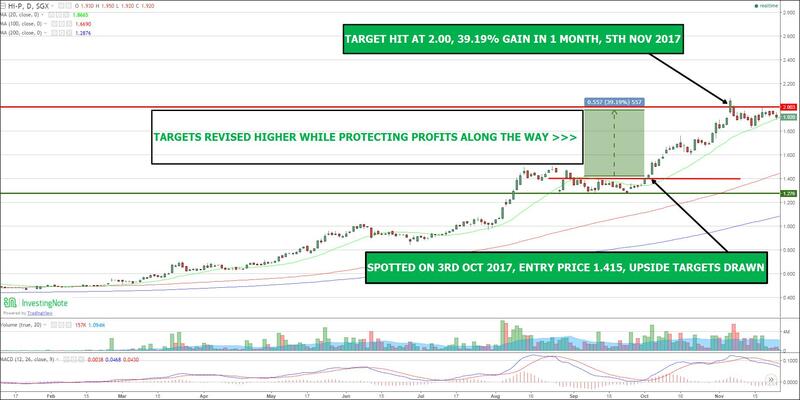 ✔ You are new to stock trading and would like to know what stocks to focus on in the Singapore Stock market every month. ✔ You are an experienced Trader and Investor, but would like to put high probability stocks in your watchlist that you can potentially reap gains too. ✔ You want to get a head start every new month and know which sectors or stocks are in play in the Singapore Market. ✔ You’ll like to know more on how Joey analyzes and plan his trades. ✔ You want to learn more about technical analysis from Singapore Top Tier Remisier and Trader. ✔ You want to find the much needed clarity in trading with the help from Joey’s expert tutelage. Joey is Singapore’s leading coach on how to make an income by trading the stock market, an author and one of the most-watched, quoted and followed stock trading trainers in Singapore. Over the years, he has conducted numerous full house seminars, enriching thousands to trade more profitably. His signature program, Precision Trading Intensive, has taken the market by storm with rave reviews and strategies not seen elsewhere. 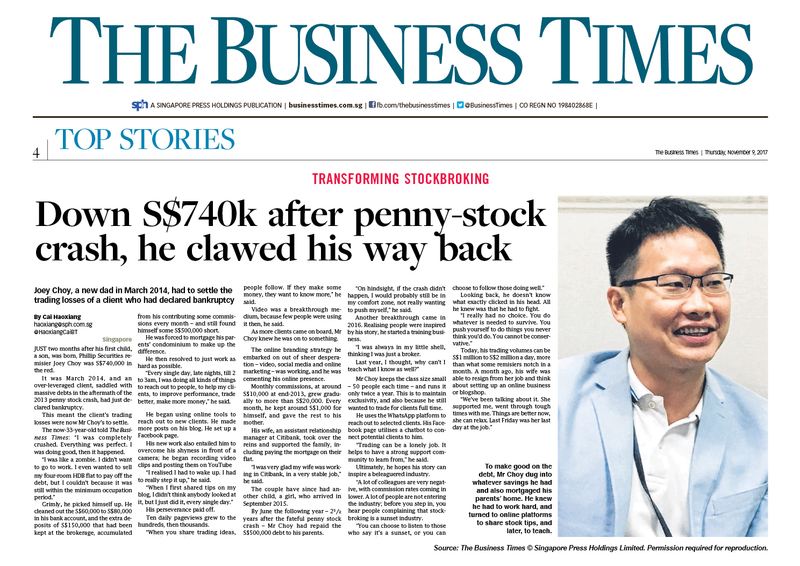 In less than 3 years, he is highly regarded as one of the Top Tier Remisiers (Stock Brokers) and Traders in Singapore. He has bagged numerous yearly awards like Top CFD Specialist 2013, Top Account Growth Achievement and Top CFD Remisier 2014 and Top Trading Representative and Top CFD Achiever 2015, 2016 in Phillip Securities. But before all the success and fame, there was his story...on how he clawed his way back from the stock market. Besides being a top trader, Joey also shares his views regularly at 938 LIVE and his blog has also been awarded the World’s Top 100 Stock Blog in 2017. He is featured as one of the leading Market Watchers at Shares Investment and a Trainer at ShareInvestor Academy. Joey is the most widely followed stock broker and trainer on InvestingNote, where he occasionally shares his views on the market and on specific counters. He had previously worked in Goldman Sachs equities team where he was mentored by some of the finest proprietary traders in the world. This message is provided strictly for information purposes and should not be construed as a solicitation or offer to buy or sell any securities, derivatives or financial products. Through this listing page or service, the addressee may from time to time be provided with investment and financial related information and reports, including but not limited to, research reports and market or securities specific analysis. In relation to such materials and information, please be reminded:- EXCEPT WHERE WE HAVE ENTERED INTO A FORMAL AGREEMENT WITH THE ADDRESSEE TO PROVIDE ADVISORY SERVICES, we provide execution - only service and do not wish to and will not advise on the merits or suitability of particular financial instruments / transactions or make any recommendation on any investment, whether generally or specifically. The materials and information in the body of this listing or send under its cover is therefore provided to you purely by way of information only and not by way of any advice or recommendation and may only be received and reviewed by you as such. All of the information report and analysis made should be taken as having been prepared for the purpose of general circulation and without regard to any specific investment objective, financial situation or the needs of any particular person who may receive the information, report or analysis (including yourself). All accompanying information and materials are also subject to such other specific qualifications and disclaimer that may specifically accompany or be attached to such information and materials.